ბურბონები მონარქები იყვნენ/არიან ევროპის შემდგომ სუვერენულ ქვეყნებში: ნავარა, საფრანგეთი, ესპანეთი, ლუქსემბურგი, ანდორა, ორივე სიცილიის სამეფო, ლუკას საჰერცოგო, პარმის საჰერცოგო. გარდა ამისა ბურბონები მრავალი ფრანგული საჰერცოგოს მფლობელები იყვნენ. ისაბელ II - 1833-1868 მეფობდა მეუღლე ფრანსისკო I-თან ერთად. ანტუანი 1537–1562, ნავარის მეფე 1555 წლიდან. Bergamini, John D. The Spanish Bourbons: The History of a Tenacious Dynasty. Putnam, 1974. Petrie, Sir Charles. The Spanish Royal House. Geoffrey Bles, 1958. Seward, Desmond. 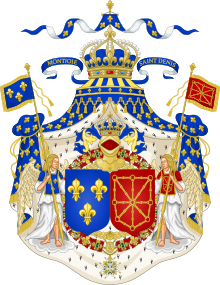 The Bourbon Kings of France. Barnes & Noble, 1976. Van Kerrebrouck, Patrick. La Maison de Bourbon, 1256–1987. ___v. Villeneuve d'Ascq, France: The Author, 1987–2000. [only Vol. 2 & Vol. 4 have been published as of 2005]. J. H. Shennan, The Bourbons: The History of a Dynasty (London, Hambledon Continuum, 2007). Klaus Malettke, Die Bourbonen. Band I: Von Heinrich IV. bis Ludwig XV. 1589–1715 (Stuttgart, W. Kohlhammer, 2008); Band II: Von Ludwig XV. bis Ludwig XVI. 1715-1789/92 (Stuttgart, W. Kohlhammer, 2008); Band III: Von Ludwig XVIII. bis zu Louis Philippe 1814–1848 (Stuttgart, W. Kohlhammer, 2009). ეს გვერდი ბოლოს დარედაქტირდა: 18:11, 30 მარტი 2019.